For Cartel Land, a new documentary about the vigilante movements against the Mexican drug cartels, director Matthew Heineman embedded himself a group of Mexican citizens led by Dr. Jose Mireles and a group of Americans patrolling the Arizona border led by Tim “Nailer” Foley. Heineman shot some 500 hours of footage. He phoned us to talk about the film. How’d you decide to tackle this subject matter? I was fascinated by what drives men and women to take up arms. There’s been a lot of coverage of narco violence and narco wars in the headlines down in Mexico. I wanted to get beyond the headlines and put myself in the middle of the violence to see how narco violence is affecting everyday people. I wanted to see how they fight back, and I wanted to see the ramifications of taking the law into their own hands. I didn’t want to make a film from the outside. I wanted to put myself right in the middle of the action. My last film was a policy film on healthcare in the U.S. It’s a film I’m really proud of but I wanted to make a different type of film. This is a character-driven film and a film in which the story unfolded before me. The documentary starts with a clip of some guys making meth. How’d you get permission from them to let you film? From the moment I stepped foot in Mexico, I wanted to get into a meth lab. Meth is the cash cow of the cartel and it’s their lifeblood. Most of the meth we consume comes from Mexico and from the Knights Templar cartel. It was important to get that. In almost every shoot, I would talk to people and ask if they knew someone. We kept getting teased and after four or five months, we gave up because it didn’t seem like it would happen. On our second to last shoot, we finally got a call to be in a town square at 6 a.m. We went to the square. A group of masked men drove us through small towns and then through some fields. I knew I wanted to start the film there and eventually we decided to end it there as well. Talk about Dr. Mireles and how you came to know him and what it was like to follow him. I first started filming in Arizona after reading a Rolling Stone article about Nailer and his guys. I filmed there for four or five months. My father sent me an article about the Autodefensas in Michoacán. Right when I read it, I knew I wanted to create this parallel about vigilantes on both side of the border fighting a “common enemy.” I reached out to some journalists and talked through what I wanted to do. I wanted to follow him and the story of the Autodefensas. I was very clearly with him that I didn’t want to parachute in and out. I wanted to follow him for a long period of time. What did you think of him? His wife says he’s like a character from a movie. He was an incredibly compelling character. When I first stepped foot in Mexico, I thought I was telling a very simple hero versus villain story. Guys in white shirts fighting guys in black hats. Over time, I realized the lines were much more blurry than I thought. That fascinated me. It drove me to keep shooting and keep going down there to see how this crazy story was going to end. Eventually, we found an ending. Talk about Nailer and how different or similar he was to the doctor. On some level, the story is a character driven. It’s about these two guys who are leading two groups. They’re both 55 years old. They both believe the government has failed them. They both have taken the law into their own hands to fight for what they believe in. The circumstances are different. In Mexico, the violence is real and visceral. In Arizona, the fight is a little more theoretical. It’s more of a fear that the Mexican drug lords will work their way across the border. When you’re in Arizona, you feel like you’re in a lawless area. It’s controlled by the cartels. They’re on the mountaintops and you can listen to them on the radio. You feel like you’re in the Wild West. What did you come away with after spending so much time with Nailer? I think the film speaks for itself. Is he working with the U.S. government to maintain some order? The doctor wasn’t working with the government. 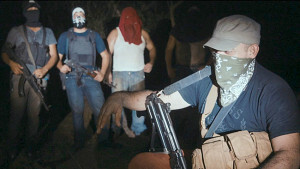 Publically, the U.S. government would disavow any connection to groups like Nailer’s. The reality on the ground is that they are working together and they are collaborating. We see that in the film. Was it difficult to gain access to Nailer? Yeah, it took several months to gain his trust. Once I was down there, we developed a rapport and I could get the access and intimacy I needed to tell the story. Without giving away the film’s end, can you talk about how surprised you were by the outcome, particularly in Mexico where it seems like the vigilantes start to lose the battle? The film unravels in a way that I could have never scripted or dreamed of or expected. I’m not a war reporter. I have been in situations like this before. The war put me in some crazy situations, shootouts between the vigilantes and the cartels, meth labs in the darkness of night, places of torture I could never imagine. The story unravels in a way I could have never expected.